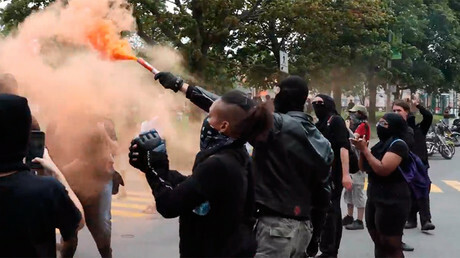 Anti-fascist protesters against an anti-illegal immigration rally by far right group La Meute (The Wolf Pack) in Quebec City pelted police, who were attempting to keep the two groups from fighting with fireworks, beer bottles and smoke bombs Sunday. Over 200 members of the far-right group attended the rally to protest “the scourge of illegal immigration,” reports The Montreal Gazette. Members of La Meute were forced to wait in a parking garage for almost five hours as police attempted to contain almost 300 counter demonstrators from Action citoyenne contre la discrimination, la Ligue anti-fasciste anti-raciste Québec and Antifa. In a statement published on Twitter, police said La Meute’s protest was orderly and lawful. Jaggi Singh, a Montreal-based activist, was the only person arrested by Quebec police so far. Meanwhile, three police officers received treatment for exposure to a chemical irritant. Nous condamnons la violence et l’intimidation. Nous vivons dans une démocratie où le #respect doit être la norme et non pas l’exception. La Meute called for stronger border control following a recent uptick in asylum seeker crossings into Canada from the United States. The number of people crossing illegally into Canada to seek asylum more than tripled last month. Over 3,100 immigrants crossed the border and were arrested in the month of July and over 3,800 asylum seekers have been arrested crossing since August 1, according to official government statistics cited by Reuters. The local security minister for Montreal, Martin Coiteux, decried the violence on Twitter and defended citizens’ rights to protest peacefully. La Meute claimed the demonstration against the migration policies of Prime Minister Justin Trudeau and Quebec Premier Philippe Couillard a success, in spite of the violence. “We made our point. I really believe this day will be the day La Meute gets out peacefully, just to the show the people what we really are,” said Patrick Beaudry, one of the group’s founders, as cited by CBC News. PM Trudeau denounced the proposed demonstration earlier in the day, as he was preparing to attend the Montreal pride parade. “The small minority, angry, frustrated group of racists don’t get to define who we are as a country, don’t get to tell others who we are and don’t get to change the nature of the open, accepting values that make us who we are,” Trudeau said before the demonstration, as cited by the Globe and Mail.